The game tells a story of a person having the worst hangover of their life, turning their night into a series of encounters with lizards and other creatures. The genre of the game is roguelike and it works like Mystery Dungeon games. 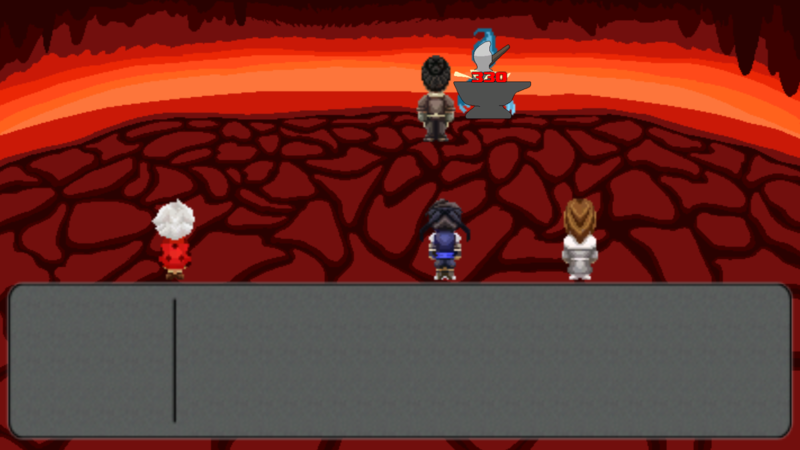 The main character goes through randomized dungeons with different sceneries. There are lizards who will attack you along the journey, but they will also drop power-up pills that make you stronger. The enemies get stronger the further the player advances in the game but luckily the power-ups stack. 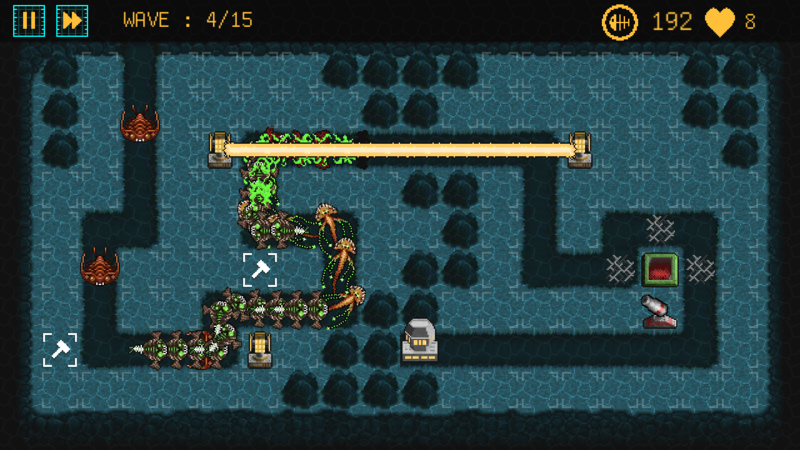 There is a boss fight every 5 floors. The goal is to advance as many floors as possible aim for a high score! The game is playable on PC and uses keyboard as controls. 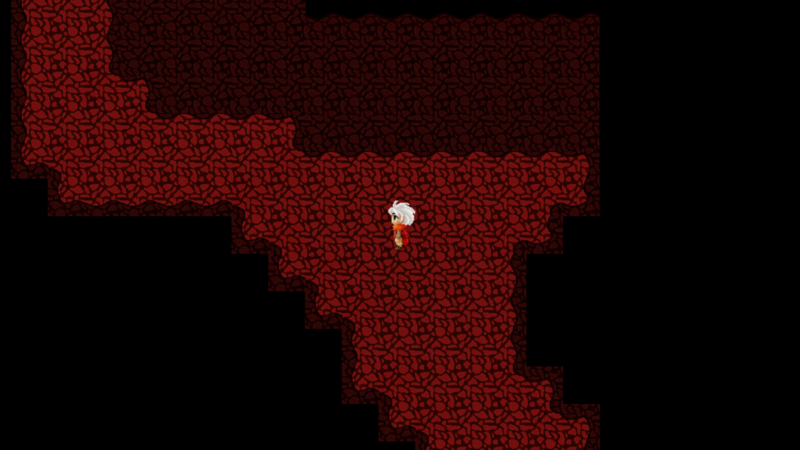 Main character going through a swamp level. We wanted to make a RPG game originally. At first we were thinking of having more elements in our game, like different classes, weapons and companions. Those ideas were scrapped quite early in the process as we realized that we wouldn’t have enough time to implement all those ideas. We chose to aim for a simpler game we could finish in time. From the beginning we wanted to make a game which would have replay value. This is why we were thinking of making many enemy types. We ended up making 4 types of enemies: a weak enemy, an agile enemy and two different bosses. To add more replay value, we were first thinking of having different classes or slight character customization, but decided to stick with one main character only. Instead we decided to make randomized dungeons so every playthrough is a little bit different. Main character in a boss fight. We hope you’ll have fun playing our game. You can download it here. The Apprentice, The Dungeon and the Goddamn Teapots is a hack and slash game set in a steampunk / fantasy world. The player’s goal is to fight through dungeon levels as fast as possible, while collecting golden cogs that drop from defeated enemies, which deducts time (2 seconds) from the clock. Getting hit adds time (4 seconds) to the clock. The player can perform a three hit combo by keeping the attack button pressed. It is only a visual feature. We wanted the later hits to do extra damage, but we pretty much ran out of development time. There’s two types of enemies in the game.The giant wasps that are fast, but can be killed easily. We thought about them being able to poison the player with their stings, but that feature had to be cut due to time constraints. They spawn out of nests. You can’t destroy the nests, but if you hit one, it’ll spawn another wasp (much like in real life). There’s also the animated armors, steam-powered horrors which can take a beating. There’s two types of traps in the game. Tesla pylons that zap the player if he / she stays next to the pylon for a set amount of time. 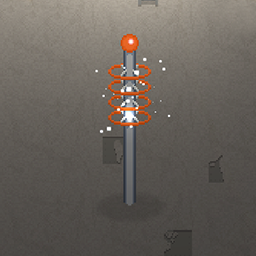 The tesla pylons are destructible. There’s the steam jets that turn on and off in set patterns. If you learn the patterns, you can avoid getting burned. There’s some destructable items in the game. It’s rather fun having to hack through a bunch of crates to get to the exit. 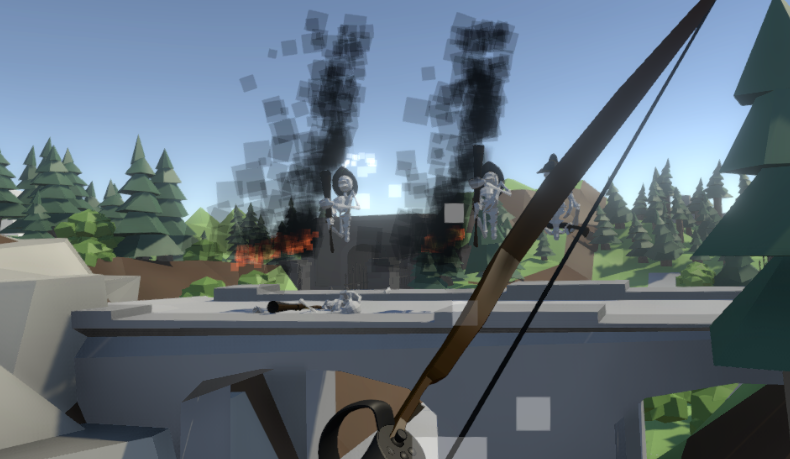 The volatile barrels explode when you hit them, there’s nothing to be gained by hitting them. We wanted to create an elaborate crafting system, where the player would gather different kinds of materials from defeated enemies. He’d / She’d return them to the forge and use them to upgrade his / her weapon. We figured out a system, where the the appearance of the weapon would change, along with it’s statistics. For example, the weapon would get longer, thus the player could hit enemies further away. Some elemental damage bonuses were also discussed. Given more time, those features would have been doable. The main character has a mechanical arm, we thought about different abilities the character could gain from upgrading his arm. Having another playable female character in the game with different characteristics was discussed. Maybe she would have had a different mechanical body part than the male counter part. We started off strong and ended strong. The middle part of the development wasn’t nearly as effective. Our Usability course had some very time consuming assignments, which slowed the development of the game. This was an essential learning experience, mostly on how to scope games better. SourceTree was a pain, until we learned how to use it properly. Everyone lost at least some work, because SourceTree overwrit made changes. We feel that we won’t be releasing the game, it would need a lot more content to actually ask money from it. Adding content takes time and our 3D game project is already starting. The volatile barrels cannot be hit. You can run outside the levels, since returning to the warp room doesn’t work. Sometimes golden cogs fly to unreachable places. Level 1’s clock doesn’t stop when you cross the finish line. 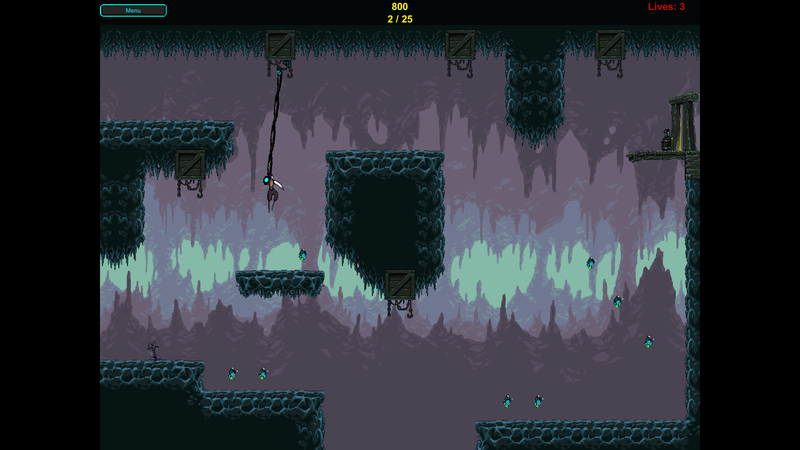 GRIP is a 2D puzzle-platformer, where player falls into a cave and must find their way back to surface. 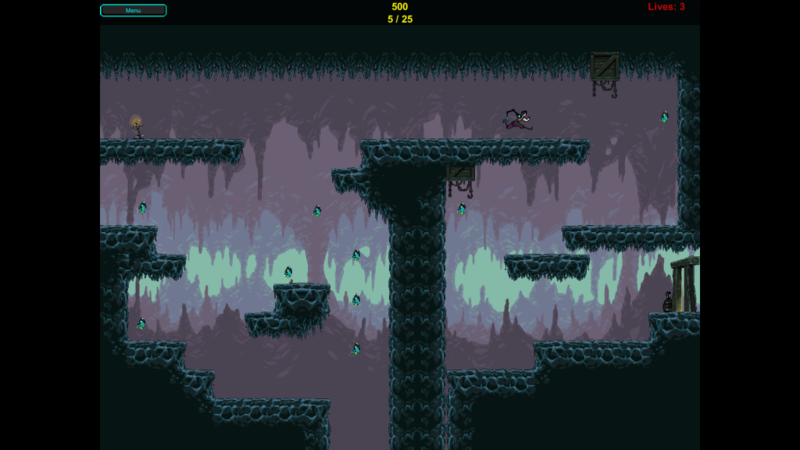 In the cave an alien entity takes place of the player’s missing arm and player can use it to help advance their journey through the cave. 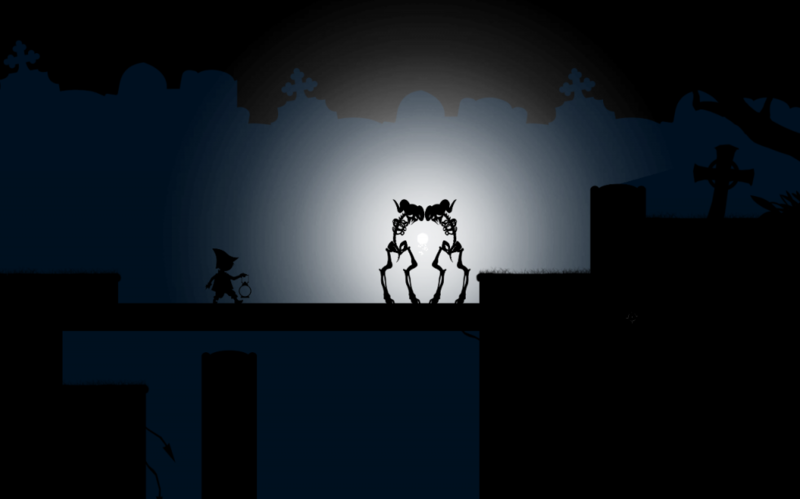 During the game player finds power-up that allows them to use that alien arm as a grappling hook. In all the levels there are also collectables that player can collect to increase their final score. Along with the basic left and right movement and jumping, player can also perform wall jumps and climb ladders. 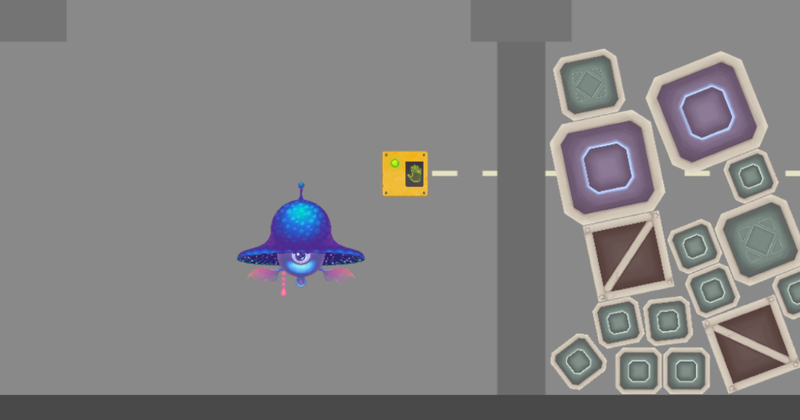 In some levels there are also interactable objects that are used to clear those previously mentioned puzzles. Since assignment was to make a 2D game we started designing platformer from the start. There was bit of brainstorming what type of platformer we would make puzzle-platformer. Initially we had planned to add monsters, bosses and story for the game, but due to lack of time we had to cut it off from the game and focus on level design and puzzles. 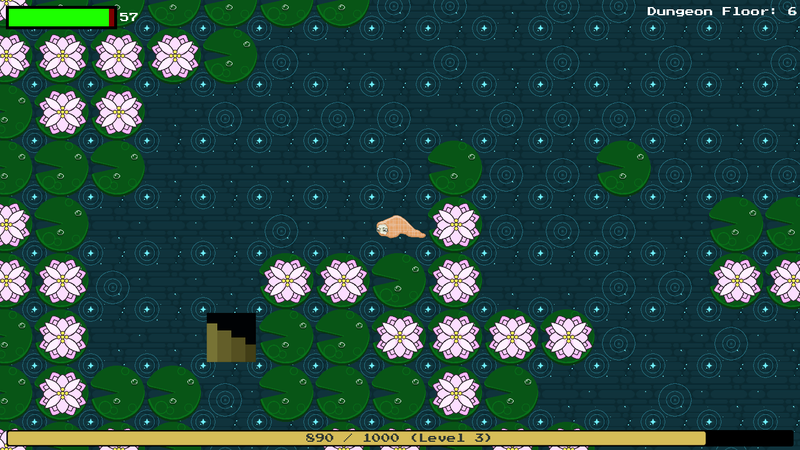 The idea was to make a Japanese role-playing game that had an old school look. 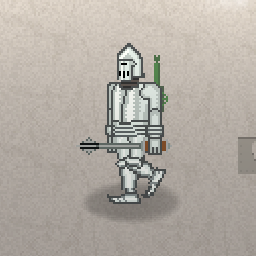 The art would be pixel art and the combat turn-based. We planned on bringing the large scope of the game down from the start. The most important things we got done were the battle system, sprites for the party and enemies and the dungeon level. We tried to have something playable each week while still getting things done. Some weeks we would get very little done and during others (especially nearing the end) we managed to do more than the previous three weeks. We could have done a better job distributing the work and fixing problems with communication and time management. We got a good amount done, though. 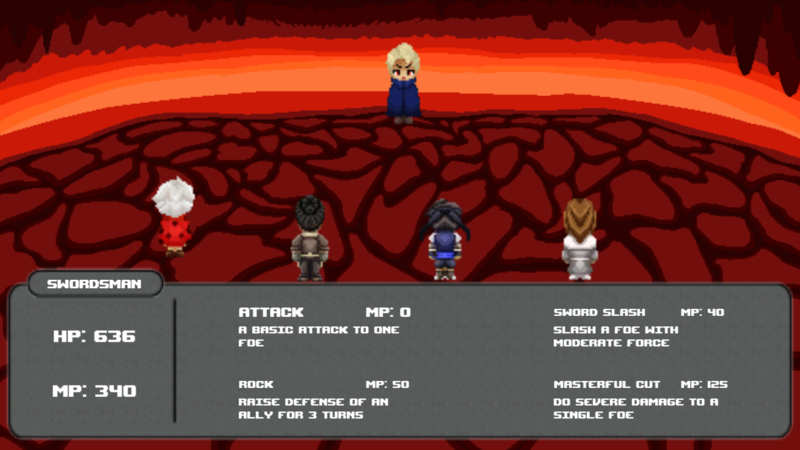 The battle system and sprites are good and took a long time to make. The project was fun and taught the team a lot. 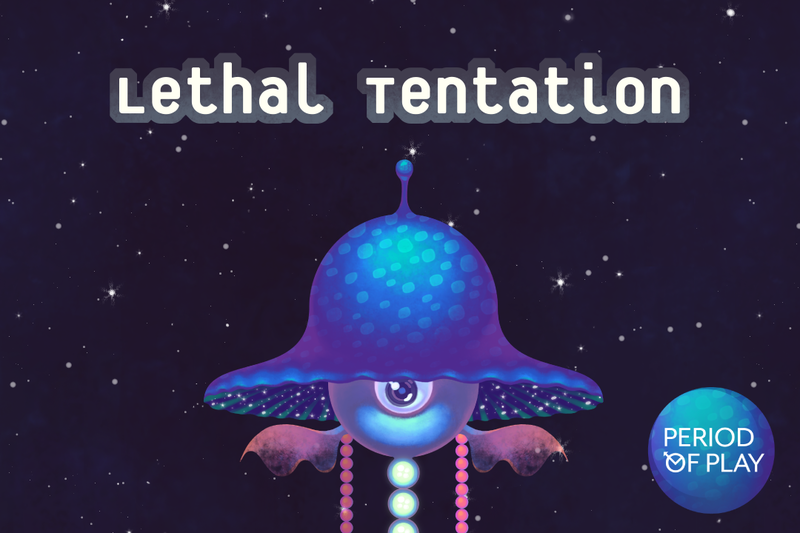 Lethal Tentation is a 2D puzzle game where you play as an alien jellyfish with electric powers. You find yourself on a spaceship, captured by its human staff and held as a test subject, and must escape by short-circuiting security panels and other machines with the electricity in your tentacles. The game has 5 different levels to play through. After brainstorming multiple concepts we came up with the idea of zapping machinery with electricity to solve a puzzle. 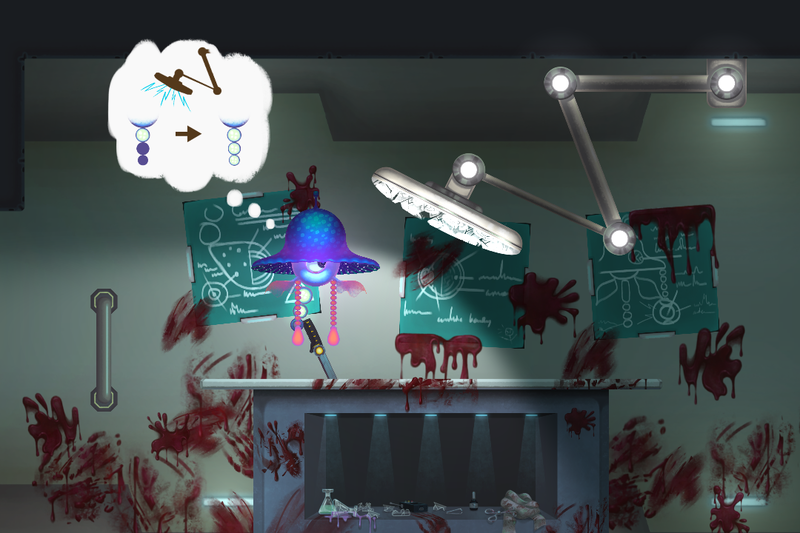 The earliest version of Lethal Tentation had the basic mechanics already nailed down: the jellyfish could zap a panel to open a door and proceed in the game. 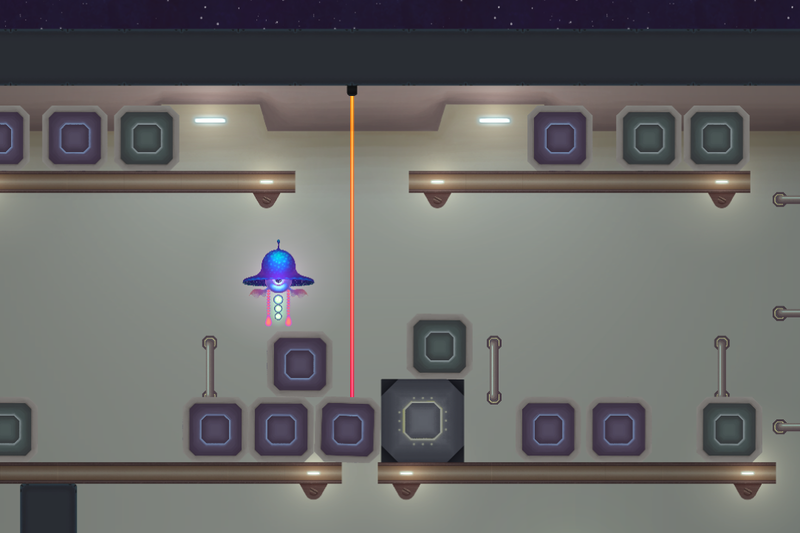 As development progressed, we began to incorporate simple physics-based puzzles to diversify gameplay. The character design was also established quite quickly, needing only a few tweaks to make it more relatable to the player. Each of the team members then designed a level, and after getting most of the basic mechanics and visuals finalized we set out to finish one level per week. The five level scope was ambitious and resulted in crunch time at the end stages of development, but we managed to finish all five levels and most of the functionality we had set out to include in the game. Since we wanted to keep the environment mysterious and the character an alien creature, we tried to avoid using plain language in the game world. This meant that we had to non-verbally communicate the controls and mechanics to the player. Because of these decisions, a whole lot of development time went into improving the user experience. For controls, we ended up using contextual thought bubbles that would show a visual tip as if it’s something the jellyfish character was thinking. Careful placement of lights and reactions from the jellyfish in the form of animations both played a big part in communicating important objects in the game world to the player. The jellyfish would look at nearby objects of interest, and point at them with a tendril when they would be close enough to interact with. When it came to visual development, we decided early on to go with a painterly, line-less art style that would work well with depicting a colorful, oddly-shaped jellyfish creature, as well as let us add different levels of detail to our environment. While matching painting styles between two artists isn’t always the easiest task, we managed to do it without encountering any large issues. Developing a style guide containing tips for color choices, possible brush uses and immediately vetoing smooth computer-generated gradients helped to control our visual style immensely. It was important to get the game’s music to reflect the setting and the underlying story, the tempo becoming faster the further the player gets in the game. The main menu music was deliberately left quite short with the chosen instrument providing mystery and a sense of being lost in space. 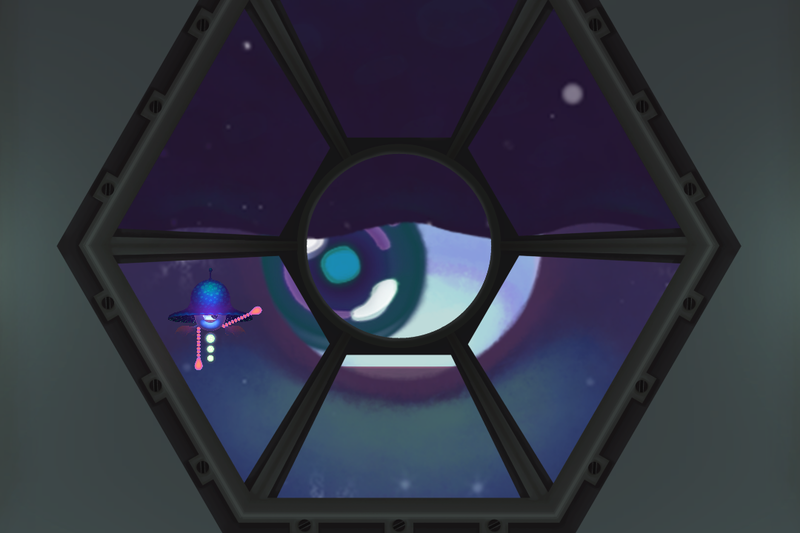 Level 1’s simple, bell-like tones reflect the jellyfish’s wonderment about its current predicament. Level 1.5 has the same mystery as the main menu music but with the added tragedy of heartbreaking violins. 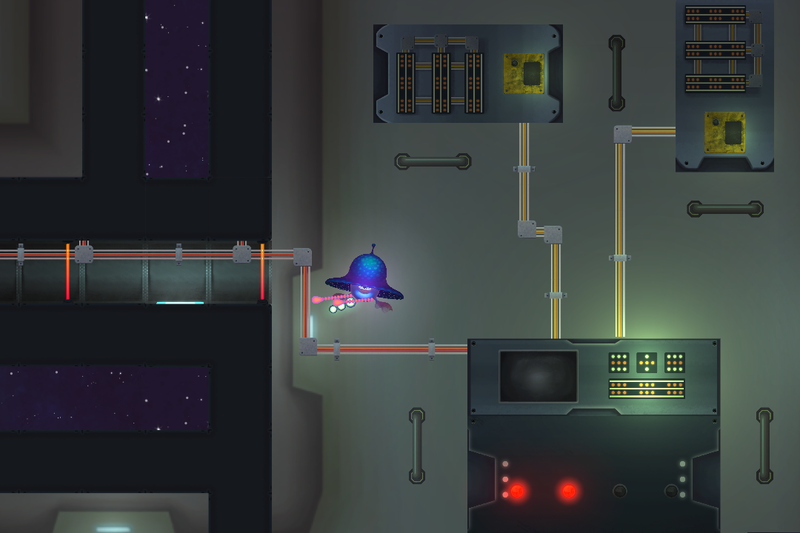 Level 2 is where the jellyfish starts really exploring the spaceship so the tempo grows faster. Level 3 starts incorporating a metallic instrument, hinting at the machinery to come. The final two levels, level 4 and level 5, are the only ones to use the metallic instrument on the foreground as befits the heavy machinery in the levels. The last two levels are also the fastest tempo-wise. The story’s resolution is befittingly heartwarming, and the end credits music works as a deliberate rev up after the lullaby. The project was done in week long sprints. Every sprint we set out weekly tasks for ourselves that we should get done by the end of the week. While ambitious, keeping up with a predetermined and strict schedule helped us maintain our pace of development and accomplish most of the goals set out for ourselves. Overall, we are pleased with the progress we made on the game and the scope that we achieved. Each one of us undeniably learned a lot about teamwork and growing our own personal skill set, and we look forward to another semester of game development! 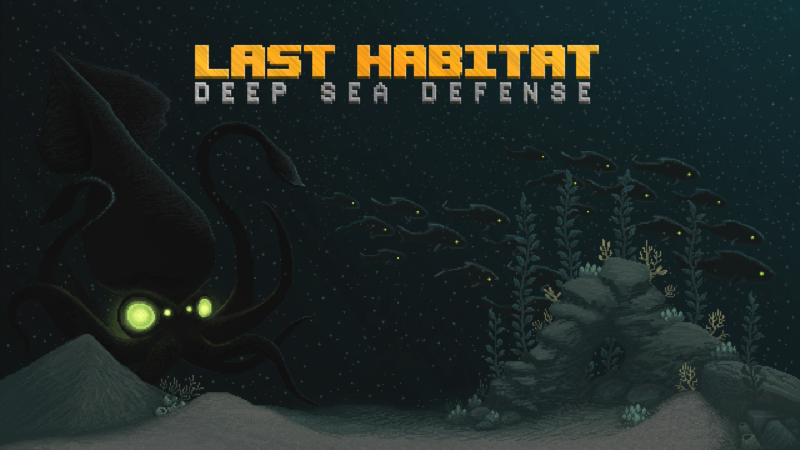 Last Habitat: Deep Sea Defense is a sci-fi tower defense game set in a grim future where nuclear wars have left continents uninhabitable and the last remaining humans are forced to live in an underwater colony. Your mission as a player is to defend this colony from human-eating sea monsters by building towers. There are four different tower types with unique properties you can built alongside a canyon that the sea monsters use to attack the colony. Last Habitat features an in-game Wiki that holds useful information both about the towers at your disposal and the four distinct sea monsters that you will encounter on your mission to protect humanity and its last habitat. Wiki that can be opened from the main menu and from the in-game pause menu. The game has five levels to play through and each level offers more content and new challenges to overcome. As you make progress in the game and unlock new levels, you will gain access to use new tower types and encounter new sea monsters to defend against. The focus of the game still remains the same: protect the colony by building up defenses and survive the waves of monster attacks that will otherwise wipe out the colony and the entire human race. 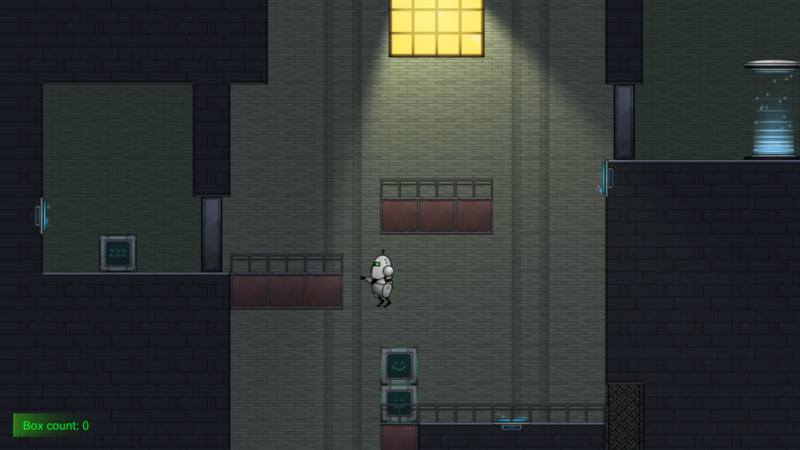 Sneak peek from level 4: Lights In The Dark with open tower build menu. The design process of the game started with a planning session where the team members narrowed down game ideas into one that could be created within a few months’ time frame. 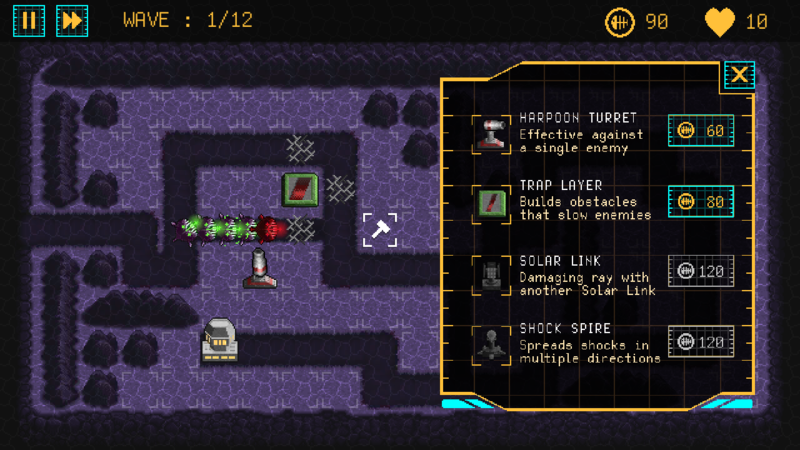 The game genre and idea was quickly chosen to be a sci-fi tower defense game done in pixel art, but initially the game was going to take place in space. To deviate from a popular choice of space as a game setting we moved our project to take place in the deep sea. Our design process continued with research on tower defense games to understand what requirements, elements and features should the game have to be a decent one. From that point we started to design the tower and enemy types and thought about how many of them would we need in our game. We came to agreement that we should aim for four different types of both towers and enemies that there would be enough variety to the game. We managed to accomplish this and also created a unique tower type: Solar Link, a twin tower that creates a damaging ray between two towers. Similar type of towers are very rarely seen in any other tower defense games and we are proud of our Solar Link -tower type creation. One built Solar Link twin tower in action and another one is being built. Our team encountered a few problems on our design process. As we were working on to create an Android game, the user interface and head-up display elements went through several changes in order to make them large enough and more easily understandable for the player. We tried to give the player more feedback about their actions and also created an in-game Wiki to give the player more information on the tower and enemy types as opposed to filling up the screen space with constantly visible lists or multiple pop-ups. The most troublesome design flaw was the initial use of an energy popcap instead of more classic in-game currency. Late in the project we had to make the hard decision to scrap the energy popcap and replace it with in-game coin currency with very little time to enhance the gameplay experience for the players. Towers can be managed from the tower menu that opens when tower has been tapped. 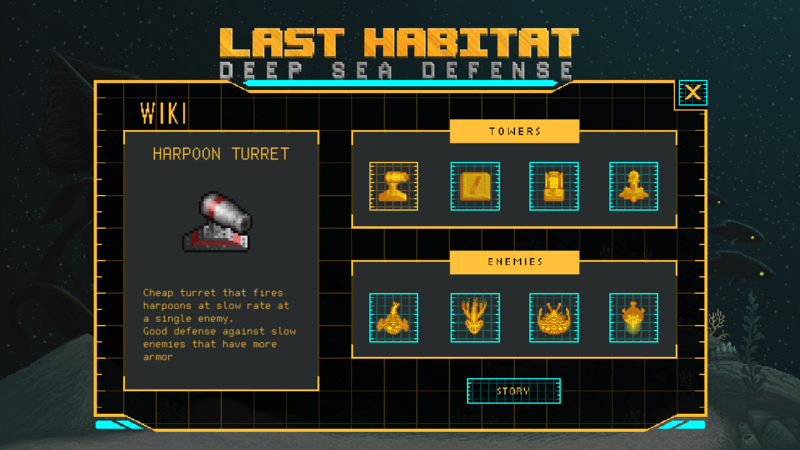 Last Habitat: Deep Sea Defense has five levels to play through. At first we had planned that the game should only have three basic levels and an endless level but after few playtests we noticed that three basic levels weren’t enough. We decided that the four first levels introduces player to all tower and enemy types and the last level is a challenge to test the player’s tactics. 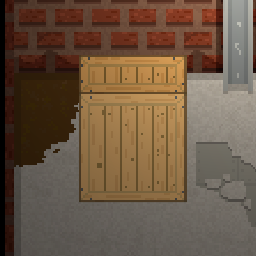 Unfortunately we don’t have the locking system yet implemented, but it will be in the published game version like the other last adjustments that we are currently working on. We were also forced to drop the endless level, as the replacement of the popcap solution with in-game currency also mixed up the games balance. We hope to still implement the endless level to the game before launching the game on Google Play Store in the first half of this year. On the launch we will also implement the achievements to the game as we will be using the Google Play Services to do it. 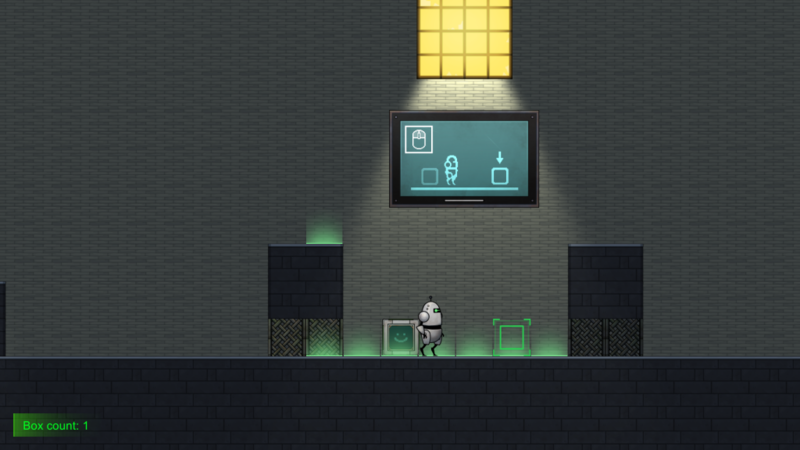 Robobox is a 2D puzzle-platformer game where you play as a robot that commands box-shaped minions. 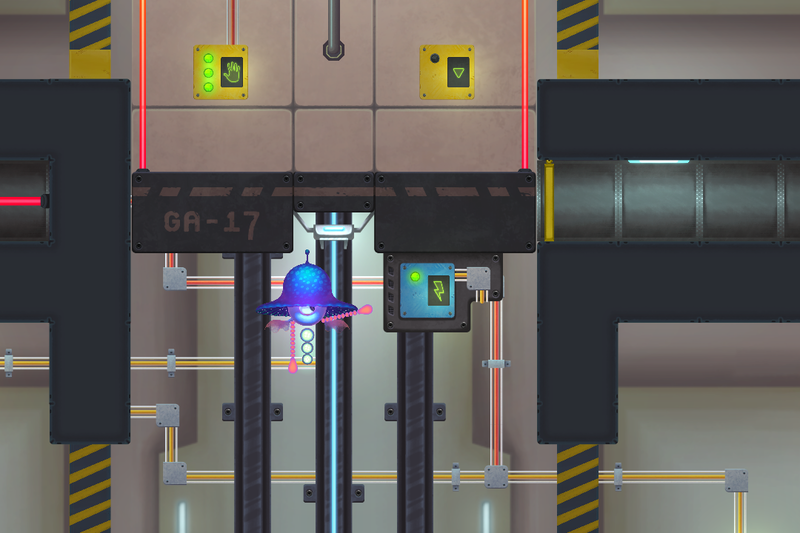 The boxes are used to build structures, such as towers and bridges, to solve puzzles and get the player through each level. The levels are hand-built, compact and feature challenges of varying difficulty. 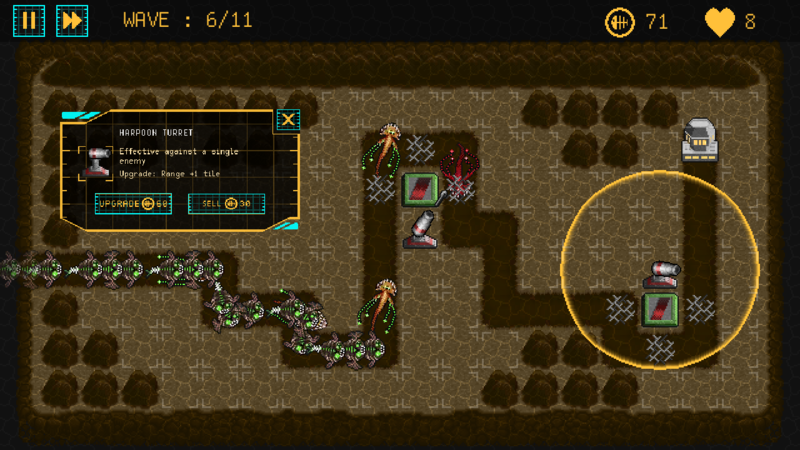 The player’s controls are simple movement and jumping, while the main focus of the game is in moving the boxes. The boxes can be attached to each other’s sides in any possible way and placed on buttons to activate doors. The design process started with a card game. We had a pack of cards each containing one game mechanic and picked five random cards from the pack. After that we thought of a game concept that would contain all of the chosen game mechanics and fit into the three-month time frame. One of the ideas was a platformer in which the player creates new platforms using living boxes, which we decided to start working on. In the beginning the game was focused more on the platformer part. We thought about adding more features, like combat, but quickly came to the conclusion that it wouldn’t fit the rest of the gameplay and scrapped it. Other features that were considered were lasers and reflective surfaces for more puzzle variety, wall magnets for more box placement options and a hub level. Eventually all of those features got dropped because ultimately we wanted the game to be simple and focus on solving puzzles with the boxes. 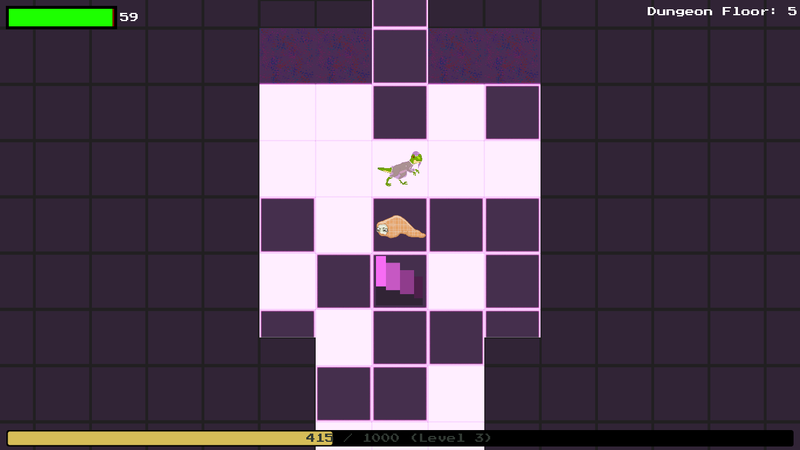 The levels were first going to be longer and the player would find more boxes on the way and sometimes abandon them to make progress. However, being forced to leave the boxes behind and to go back to pick them up again caused mixed reactions during our playtests. As a result, the levels were scaled down and the player was given the ability to teleport all boxes to their own location at any moment. Teimme kahden hengen voimin GameCampin puitteissa tornipuolustuspelin VR-ympäristössä. Alkujaan ideoimme myös mahdollista seikkailupeliä, mutta aikatalun ja tiimin koon ansiosta päädyimme laajuudeltaan pienempään tavoitteeseen. Bone Siegessä pelaaja toimii itse tornina suojellen porttia sitä hyökkääviä luurankosotureita vastaan. Pelaaja pystyy siirtymään(teleporttaamaan) toiseen torniin tarpeen mukaan. 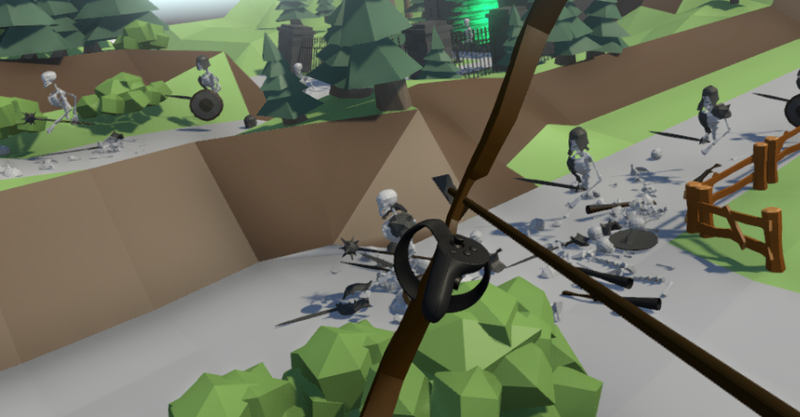 Aseena toimii jousipyssy ja peli-idean esikuvana toimiikin varsin hauska VR-peli Longbow. Vihollistyyppejä tässä vaiheessa tuotantoa on kaksi, lähitaistelija ja muskettisoturi. Vihollisten panssarointi vaihtelee mikä tuo lisähaasteensa. Peli on vielä kehityksessä ja julkaistaan syksymmällä. 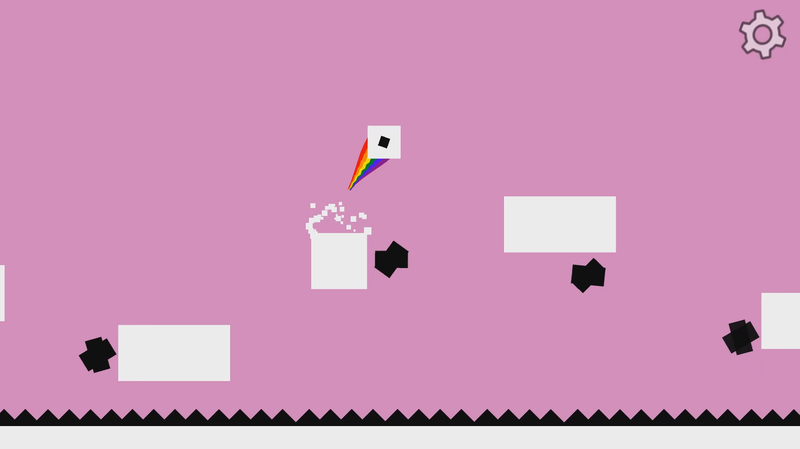 Brave Bouncy Box is a minimalist, serene and challenging platformer. 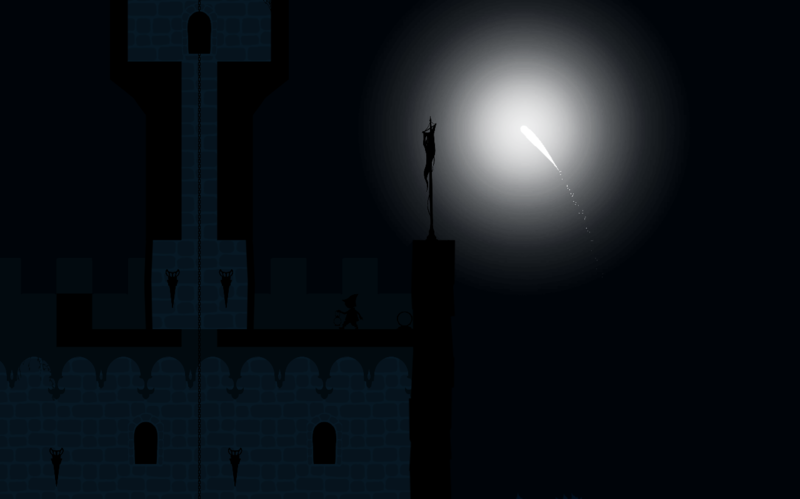 The game’s development started with a simple question – “what if I made a platformer where the player bounces automatically?”. All other aspect of the game were honed to support this one core idea, which proved useful under the strict time limit and low resources for development. Päätimme käyttää Game Campia hyväksi jatkaaksemme viime syksynä tekemäämme peliä “Forget Not”. Kesän ajan olemme tehneet töitä pääosin erikseen, mutta pitäneet yhteyttä säännöllisesti. Forget Not on 2D-pulmatasohyppelypeli, jossa vaihdellaan ohjausta pelaajan ja lyhdyn valon välillä ratkaistakseen tasojen pulmat. Viholliset ja ympäristö reagoivat valoon eri tavoin. Lisäksi jokaiseen kenttään on piilotettu salainen tähti pelaajalle löydettäväksi. Peliin on luotu uusi kenttä, joka toimii pelin ensimmäisenä tasona. Vanhojen kenttien tasosuunnittelua on paranneltu ja muunneltu. Koodin puolesta suurin osa bugeista on korjattu, kontrolleja on hiottu ja parallax-efekti lisätty. 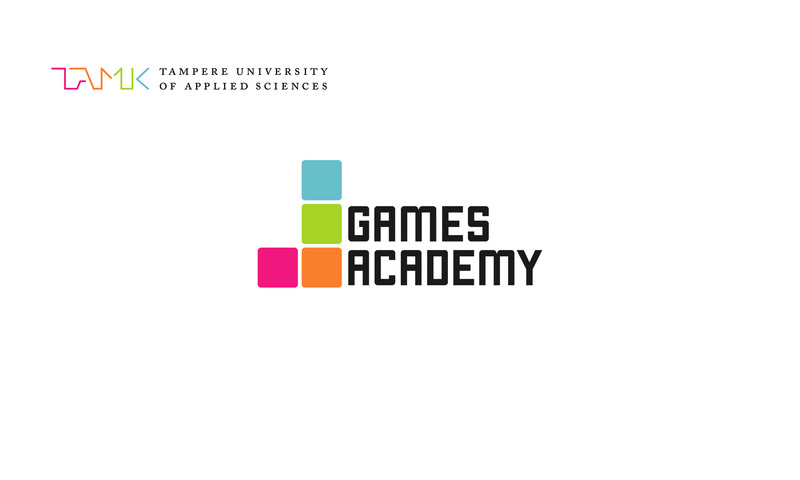 Tiimin graafikko teki töitä myös toisessa Game Camp -projektissa samanaikaisesti. Graafisesti lisäsimme peliin animaatioita ja uuden kentän uniikit grafiikat. Lisäksi peliin on lisätty partikkeliefektejä.